Harry Anderson in action for Posh at Dulwich Hamlet. Photo: Joe Dent/theposh.com. Peterborough United manager Dave Robertson is looking forward to seeing his players take on the challenge of Premier League opposition at the ABAX Stadium tomorrow (July 11). Posh host West Ham in their first home friendly of the summer (3pm kick off) and ‘The Hammers’ have promised to send a strong squad. Posh opened their friendly season with a 3-2 win at non-league Dulwich Hamlet on Wednesday (July 8) and the team’s performance pleased Robertson who also thought there were some outstanding individual displays. “It was a great workout at Dulwich,” Robertson enthused. “The pitch was excellent and the opposition were decent. I managed to get some game time into some of the younger members of the squad and of course the result was good. “Obviously it’s a step up tomorrow as West Ham will bring a side with experience and quality, but I’m looking forward to seeing how my players cope with the challenge. “There were some excellent displays at Dulwich. Harry Anderson was sensational, he’s just a machine and he could play three 90 minutes in a row right now. 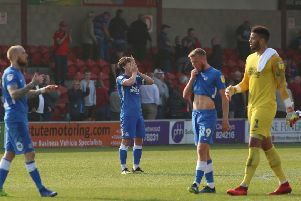 Joe Gormley gave us a glimpse of what he will bring to the team, and Marcus Maddison and Jon Taylor looked sharp on the wings. Posh hope to get some minutes into their new signing Jack Collison, a former West Ham player. Those who played for 30 minutes at Dulwich are likely to get an hour against West Ham. Two triallists did play at Dulwich and they are expected to be involved against West Ham. The players concerned are believed to be Kieran Sadlier, a former West Ham youngster, who played for St Mirren in the Scottish Premier League last season, and Andrew Fox, a local lad who has been playing in the United States. Sadlier is an attacking midfielder who scored four goals in two internal practice matches ahead of the Dulwich match. Both will be taken on the club’s brief tour of Ireland next week. The winger from Real Madrid who spent time on trail at Posh has returned home. Tickets are priced at £10 for adults (there is a £5 price increase on the day), over 60s and 18-21-year-olds and £5 for under 18s.